Burlington's fine steakhouse excels with dry-aged local beef and metropolitan sophistication. 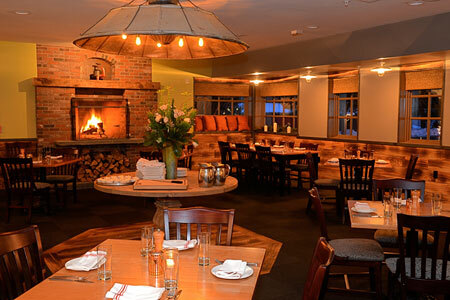 : Guild Tavern’s open kitchen and blue soapstone bar make it hard to believe this restaurant used to be a Ground Round. With sophisticated décor and the aroma of a wood-fired grill, guests quickly find comfort in the dining room’s inviting nooks. Chef-owner Phillip Clayton sources everything locally for the seasonal menu, from eggs and artisanal breads to beets, cheese and chicken. Steaks are dry-aged, hand-cut and grilled to order over a hardwood fire. These cuts are comparable with the best big city chops, and priced to match. Start with fresh oysters or cream of asparagus soup before splurging on the rib-eye. Whether undressed or in a classic béarnaise, the smoky meat rewards with every bite. Sides include braised greens, an array of potatoes and roasted vegetables. Tartare and salmon are expertly plated, as is a New York strip, which is nearly as tender as the filet mignon. Pair the spit-roasted chicken with a Pinot Bianco, and reserve big Cabernets (like the voluptuous Cane & Fable ‘373’) for Guild’s prized beef. Intrepid drinkers can finish with craft spirits like Vermont-made vodka, an apéritif or bourbon and maple bitters. We prefer espresso alongside amaretto cheesecake capped with anglaise and whipped cream.